To monitor Teradata performance in order to detect possible vulnerabilities that cause DBMS malfunctioning and find solutions to eliminate such obstacles, Teradata Monitoring Tools of Database Performance by DataSunrise may become developer’s effective expedient means. It may also be useful for application debugging and development. When you struggle with Teradata performance malfunctions, you need to have an accurate and deep understanding of DBMS processes. DataSunrise software product may be adapted to suit this purpose. Teradata monitoring of its performance makes troubleshooting easier as it offers complete visualization of DBMS performance. With data provided you will be able to track Teradata processes, identify bottlenecks during database operation, assess what causes operating delays, easily debug and develop applications. To examine logs of queries sent to the database. This may be useful in case of revealing redundant or unexpected by a developer queries. To get response logs. You may appreciate their practical value, for example, while searching for what may cause application malfunctions, as it is not always possible to add logging to an application or it may require extra logging, if its own one is not sufficient for some reason. To estimate time required to execute a query. To track dynamics of query change in time. To determine query types (INSERT/UPDATE/DELETE/SELECT) and their execution frequency according to these types. To analyze number of rows in INSERT/UPDATE/DELETE/SELECT operations. To examine diagrams displaying their change in time. To acquire general information on the number of operations executed per second. To evaluate data volume that has been transmitted and received by a server, etc. To analyze other material provided. 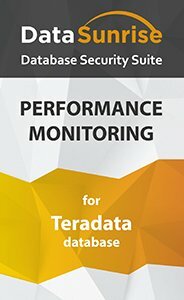 DataSunrise software product with Teradata Monitoring Tools of Database Performance facilitates your DBMS performance analysis required to identify related problems and remove barriers to Teradata normal operation.